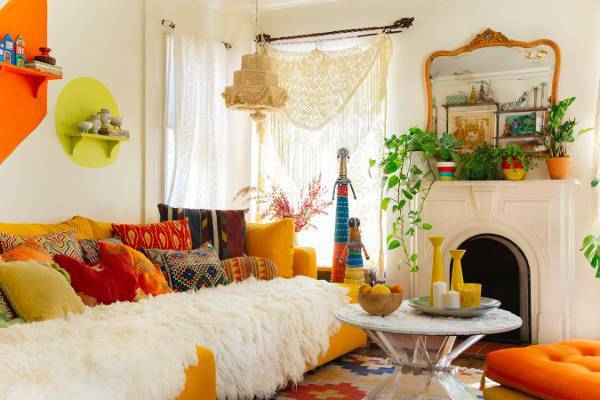 The Bohemian decor is generally considered a mix of everything. With a judicious blend of eclectic, modern and vintage, a Bohemian look holds the potential to complement and contradict each other at the same time. 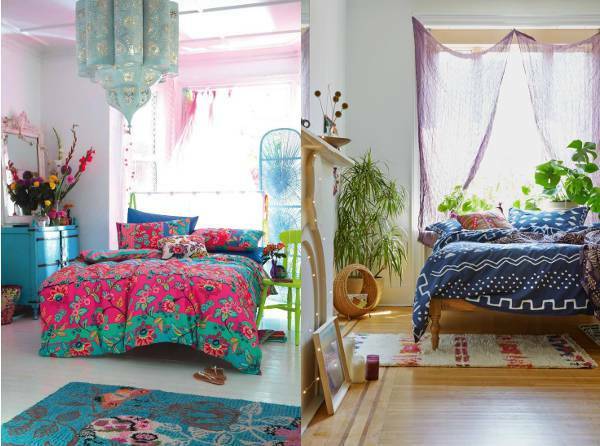 If you are looking to bring a gallery like presence to your bedroom, Bohemian is one style to opt for your space. 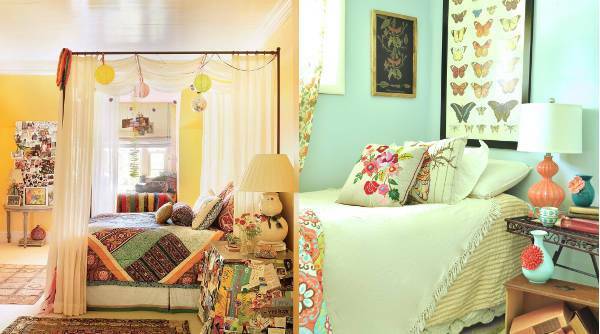 The below mentioned 10 Bohemian style bedrooms with their unique style and presence will certainly help you turn around the look of your home. When we talk about a Bohemian chic bedroom, the combination of blues and violets takes up a lot of space in our imagination. It might look bold and exceedingly edgy and hippie but the inclusion of artsy stuff makes all the difference. 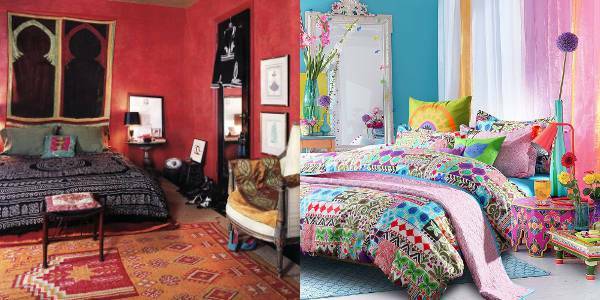 Bold hues and rich textiles bring a beautiful contrast to the white walls and earthy plants in the bedroom. Lending a laidback ambience, the balanced appearance makes the elements and features pleasant and appealing. 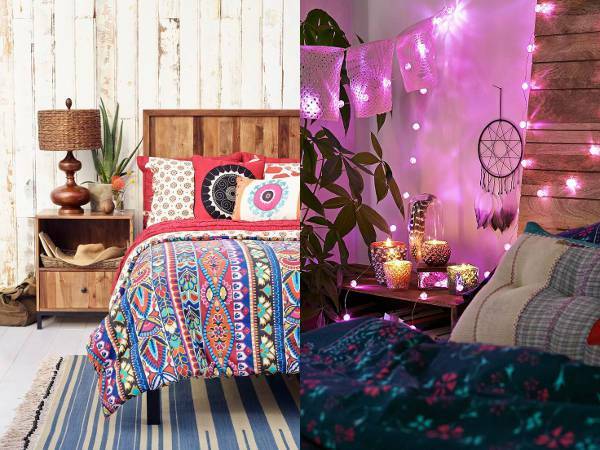 If you are looking to bring a summer Bohemian touch to your bedroom, try and add colourful paper lanterns to the corners of your space, this will bring an artistic and experimental touch to your space. Don’t shy away from including bright and vibrant coloured walls in your bedrooms as the bright colours when paired with other bold colours and patterns makes the appearance look like a scene from modern Mexican bazaar. You can also give a classic Bohemian touch to your space with the help of an all white palette. 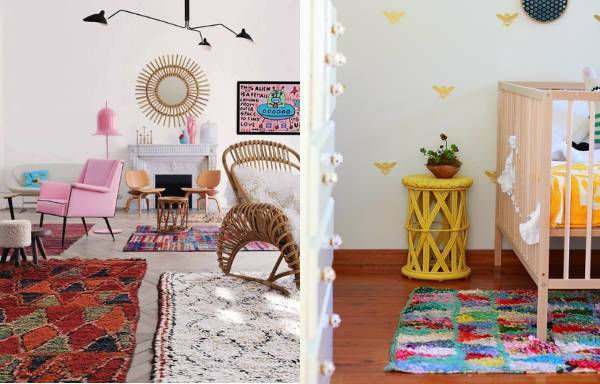 With a 70s inspired twist, the all white palette beautifully complements with ornate rugs and pillows. You can blend chic and Bohemian with the use of a wooden table top that is accessorised with a single orchid and the bed filled with a multitude of printed pillows. Sleek and attractive, the room will instantly enhance the look without being too overwhelming for the eye. 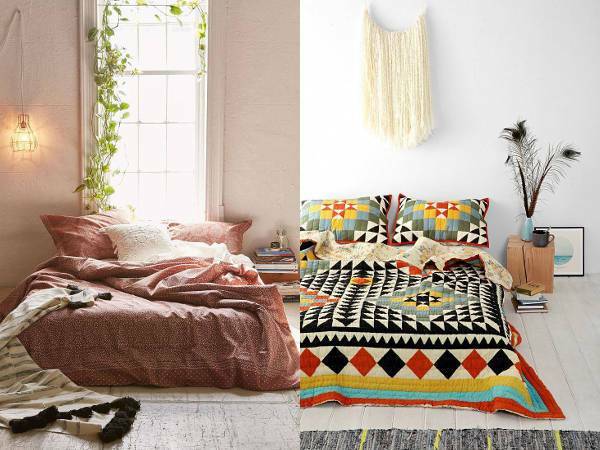 You can also opt for floorbeds instead of the regular raised or platform beds to give a Boho touch to your bedroom. 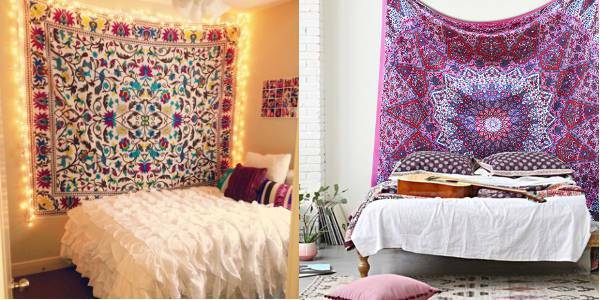 Make use of tie-dye blankets and give your bedroom a touch of the 60s. 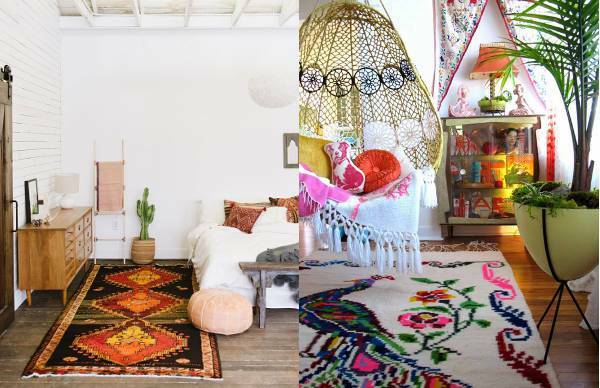 A tribal print rug works just as well on the floor as a hanging on the wall. 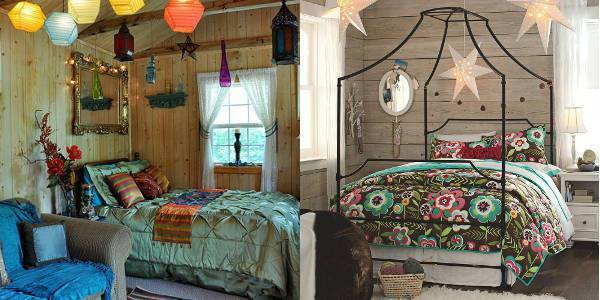 Use the tribal print rug behind the bed to make it look like a makeshift headboard. 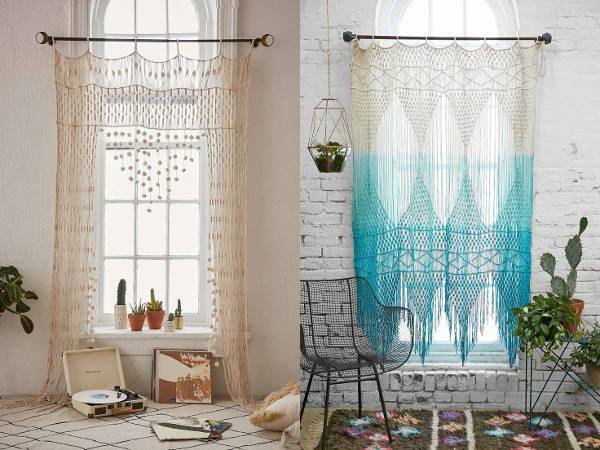 A crocheted curtain can bring a chic twist to the entryway of an understated bedroom. Edgy and attention grabbing, the curtain holds an unfinished quality that can bring a distinctive touch to your space. 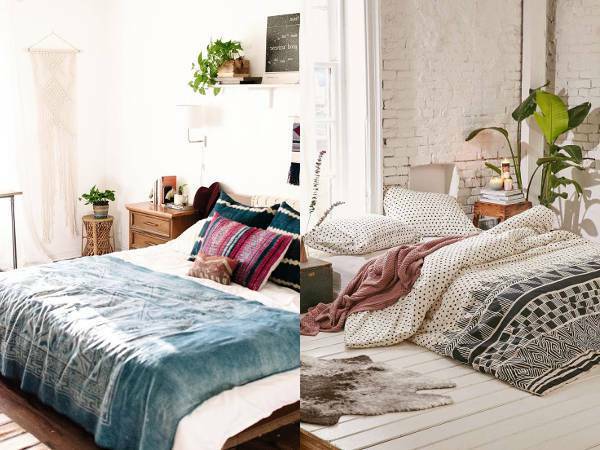 Don’t hesitate to add a bundle of textures and patterns to your bedroom. 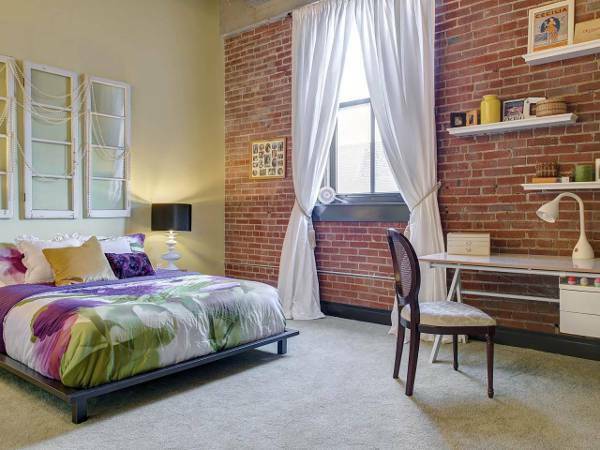 Whether it is with industrial ducting, exposed brick or rich patterned Tibetan rug and satin bedspread, all the elements will support the vibrant look of your room without being too overpowering. Take inspiration from the above mentioned designs and release your inner Boho the coming year with a bang.